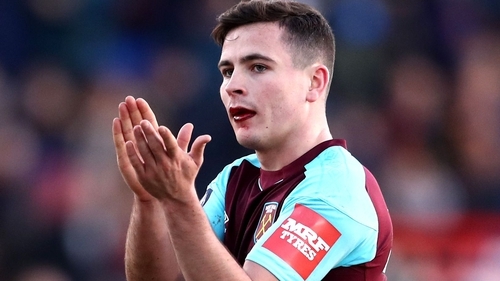 Republic of Ireland U21 international Josh Cullen took a nasty blow to the face in the closing stages of West Ham’s draw at Shrewsbury, but he gained praise from boss David Moyes on a day his team-mates failed to fire. The Shrews earned a deserved FA Cup replay after a scrappy stalemate at the New Meadow. Cullen was given a rare start having just returned from a loan spell with Bolton Wanderers, and he shone on the right before Moyes stationed him in the heart of midfield to help his team keep the ball better. The 21-year-old Essex-born playmaker was accidentally booted in the mouth by Abu Ogogo in the closing stages, receiving lengthy treatment as blood poured from his face and some of his teeth went flying. He returned to the fray and completed the match, with Moyes - overall deeply unhappy with the performance - singling Cullen out afterwards. "Josh was probably our best player today," he told the club’s website. "Considering he’s only just come back and we’re getting to know him, he did well. "He had two teeth knocked out and he’s gone straight to A&E to see if they can save them." Another rising Irish talent, Declan Rice, also played the 90 minutes in Shropshire and delivered another composed performance in defence. He was named man of the match after the Premier League 1-1 draw at Spurs. Apart from those two however, there was little else for Hammers fans to be happy with, and Moyes accused his players of lacking fight. "I don't think we showed any quality and the biggest disappointment is I didn't think we showed enough steel," he added. "When you come to places like this you have to show yourself physically, that you can battle and compete. "I didn't think we did that at all and that was the worst thing about it. Sometimes it's not easy. The conditions - the sun - didn't make it easy for the players to see things around them but that didn't stop the fact that we didn't compete on a lot of occasions. "Obviously if you compare Wembley and Thursday night, it's a big change. But it's a mentality thing. You've got to go and show that wherever you are, you've got to respect whatever players you're against and recognise it's going to be tough. For the first half especially, we didn't compete at all."